Single Deep Well Plate (DWP) thermal unit with SBS footprint provides end user with sealed flip top acrylic top cover to maintain and protect environment surrounding DWP. The temperature range the unit maintains is -10°C to + 125°C. There is simple access to DWP via flip cover, which seals upon closing, preventing environmental influences entering or escaping cover. 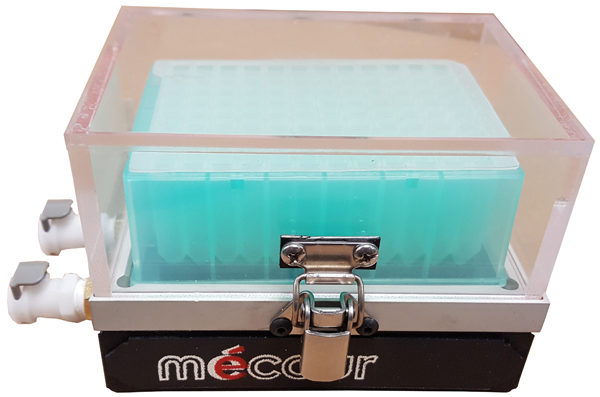 MéCour units are available in any plate style (PCR, 96, 384 or culture plates) and have capacities from 2 to 8 plates. MéCour provides corresponding Thermal Insert that accommodates underside of plate and via thermal pins and transfers maximum heat exchange to all plate wells.